Over at Splitcoast today the Inspiration challenge – with some wonderful art from GelaSkins to inspire us. I chose this fabulous skin from Gary Odom as my inspiration. It made me think of a flower and paisley. So I used a piece of paisley designer paper to make a flower. And, another Hope You Can Cling To challenge – to have something hanging on your card. I’ve used a standard A2 card base. Layered on top of that is a slightly smaller piece in Old Olive. On top of that, another piece of Blushing Bride that’s been dry embossed and distressed. 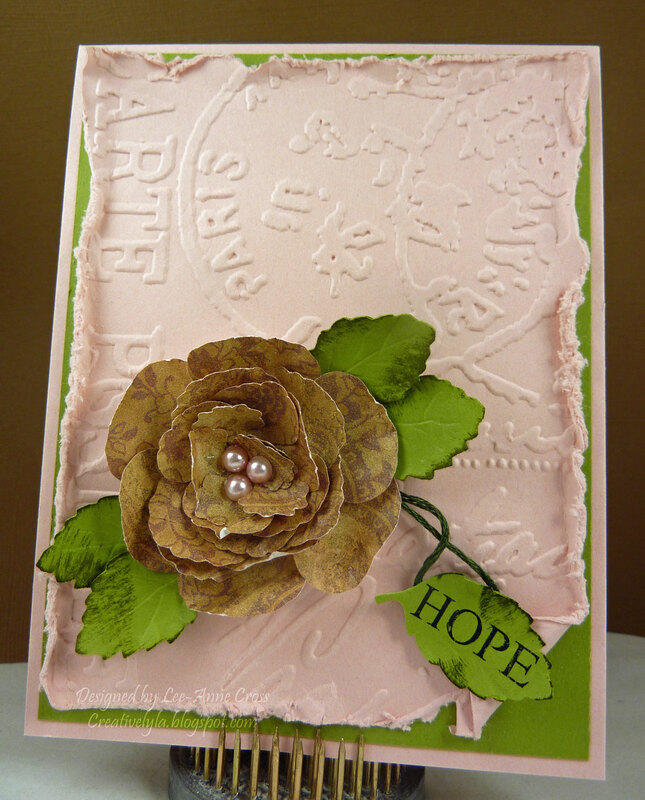 The flower is made from an old piece of designer paper from my stash, using the McGill Paper Blossoms punches. The pearls in the center have been colored with a Copic. I used a small piece of embroidery thread to “hang” my “HOPE” leaf from. The word was computer generated.